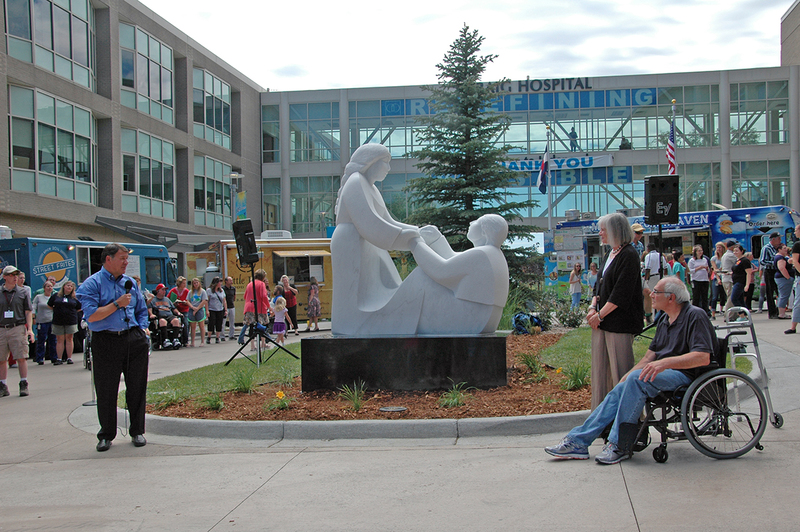 Craig Hospital unveiled a new sculpture at the hospital’s newly renovated front entrance. Colorado sculptor Madeline Wiener created the marble piece which depicts a woman helping a man off the ground. Madeline Wiener describes the sculpture she created for the entrance of Craig. “I hope that people immediately grasp the care given at Craig and the determination of the patient who may be in the worst shape on entry to Craig, but accomplishing the impossible,” said Wiener. Madeline’s connection to the project is considerably poignant given that her husband, Matt, was a Craig Hospital patient in 2010. Matt sustained a spinal cord injury in a surfing accident in 2009. He was a patient at Craig Hospital for 60 days in 2010. 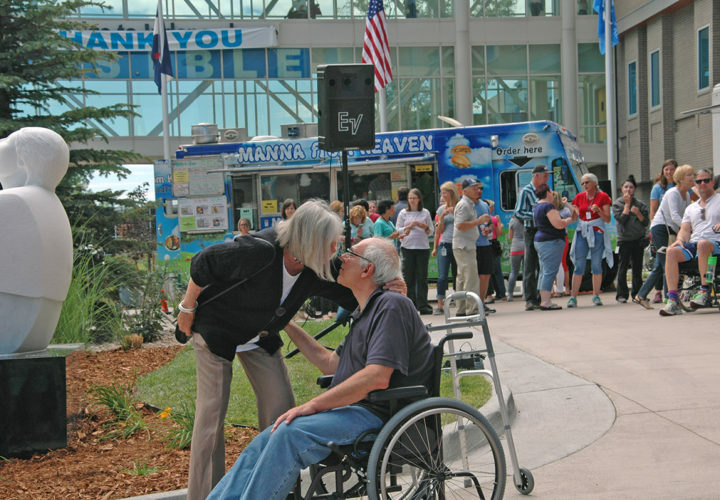 Madeline Wiener kisses her husband Matt during the unveiling ceremony. The sculpture is made from marble quarried form Marble, Colorado. It will be displayed in the front circle drive near Craig’s new accessible garden plaza. The garden plaza is part of Craig’s major campus expansion and revitalization project that began in 2011 and is scheduled for completion in 2016. The project adds approximately 85,000 sq. feet of new space, and includes the renovation of approx. 135,000 sq. feet of existing space in the West Building. The accessible garden plaza connects the West and East buildings to create a unified campus. Madeline studied at The New York School of Visual Arts from 1968-1974. She is the founder and director of The Marble Institute of Colorado. Her sculptures are all over the world, including Scotland and India. The concept came from the care and hope of improvement, when we didn't really believe it was possible for him to move again; each day giving more hope.